Joseph Brimacombe took this photo of Comet PanSTARRS on May 23, 2013 from New Mexico using a FSQ 10.6-cm and STL11K camera at 10h 07m UT (mid-point). The image was taken in a single 30-minute exposure. Comet Pan-STARRS slices through the night sky like a bright blade of light in this stunning image by an amateur astronomer. Skywatcher Joseph Brimacombe captured this comet photo on May 23 from New Mexico using a FSQ 10.6-cm and STL11K camera at 10h 07m UT (mid-point). The image was taken in a single 30-minute exposure. Comet Pan-STARRS, named after a telescope in Hawaii, is thought to have an elliptical orbit around the sun that creates an 110,000-year path. The comet was discovered in June 2011 by astronomers using the Panoramic Survey Telescope and Rapid Response System (Pan-STARRS), a telescope that searches for near-Earth objects from a perch atop Haleakala volcano in Hawaii. The comet is officially known as comet C/2011 L4 Pan-STARRS. 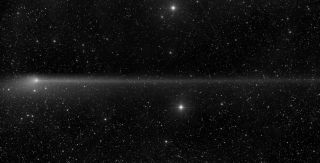 On March 10, the comet made its closest approach to the sun, flying within 28 million miles (45 million kilometers) of the star before heading on its way back to the outer solar system. Comet Pan-STARRS is one of several comets in the night sky in 2013. Later this year, the much-anticipated Comet ISON will make its closest approach to the sun and could potentially become the "comet of the century" if it lives up to the expectations of some astronomers. Comet ISON was discovered in September 2012 by amateur astronomers in Russia and will approach within a mere 800,000 miles (1.2 million km) of the sun on Nov. 28 during its pass through the inner solar system. If the comet survives the encounter, it could flare up into a brilliant night sky object, potentially shining as bright as the full moon seen in daylight conditions. But the comet could also fizzle out, so astronomers are keeping close tabs on Comet ISON to track its progress.